Picture the scene… It’s a warm, sunny weekend and my view is the magnificent rolling hills of the Oxfordshire landscape. For me, this is exactly what caravanning is all about: getting back in touch with nature and unwinding from the everyday stresses, with some creature comforts of course! 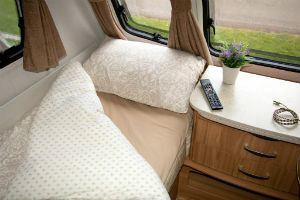 One of the biggest criticisms of caravanning, however, is the sleeping arrangement – not so much the effort of putting beds up, or converting seating into bunks or double beds, but the level of comfort that a caravan bed fails to deliver. 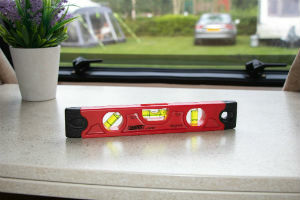 It might seem obvious that a caravan or motorhome needs to be level (for the fridge to operate correctly and to allow water to drain from the sinks and showers), but the unit needs to be level to ensure a good night’s sleep can be achieved. If you are waking up with a headache or slightly swollen feet, do check that your outfit is level. We had this issue when we pitched up on a slightly soggy pitch; the caravan was level but, after a day, one side of the caravan had started to bog down. After some readjustments though, we were fine. It may not be at the forefront of your mind, but if you don’t have a fixed-bed layout and are, instead, converting the seating into a bed, you should turn the seating cushions over. This is for two reasons: the seating pads in many cases are sprung in slightly different ways to allow a soft seating pad and a slightly harder sleeping base; also, the bottoms of the pads will be flat (unlike the seating pad) – making for a dead-flat sleeping platform. How specific caravan or motorhome seating and sleeping configurations work is dependent on the make and model. With some adjustment, fiddling and testing of the best combination of pads, you will confirm how to make the best possible sleeping arrangement. Let’s be honest, pillows, duvets and sheets can occupy a lot of space – and especially in a caravan or motorhome, space is at a premium. A lot of what is contained in pillows and duvets is air, so using zip-lock vacuum bags is a perfect way of having a plump pillow and duvet set while in the caravan. The bags seal up and have a simple one-way valve that allows a vacuum or small hand pump to be connected and the air removed from the bag. When the air is removed from the bags, it is staggering to see how much the pillows and duvets shrink by. We can pack two pillows and a single duvet in one bag and stack three of these under the front seat in the caravan – leaving plenty of space for other items too. There is another benefit as well: once home – and once all the bedding is clean – placing them back into the vacuum bags will remove the air and keep the bedding fresh until next time. This ensures that storing the bedding in the caravan in off seasons will not attract damp or bad odours – leaving perfectly fresh and clean bedding instead. This isn’t a sales pitch, but an honest opinion from someone who purchased mattress toppers a few years ago… They have revolutionised my sleeping comfort level by a huge amount and are, without question, one of the top five things I must have in the caravan. I purchased two mattress toppers three years ago and I have used them in either a single-bed configuration, or alongside each other – making for a very comfortable double bed. The mattress toppers complement the hard-sleeping pads in the caravan. The pads provide the firm base, while the mattress toppers afford a cosy, comfortable bed to sleep in. For anyone who suffers from a bad back, or for those who want an extra level of comfort, mattress toppers are essential and highly recommended too. Modern-day caravans are not the damp, leaky and cold spaces they once were; in fact, quite the opposite is now true. They are well-insulated, warm and invitingly cosy of an evening. 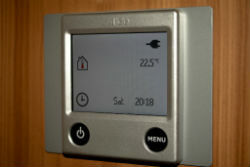 One downside, however, is the warmth that they maintain during the night; therefore, it is important to lower (or even switch off) any heating that the caravan may have installed. Lowering the temperature by 3-4°C may be enough for a cool night’s sleep – and don’t forget to open a window if the summer heat is getting too much. If you are a naturally hot sleeper and find the mattress toppers too warm to sleep on, Duvalay have introduced a range of mattress toppers called FreshTec. They perform just the same as standard mattress toppers, but they also allow body heat to escape and dissipate through the topper and into the mattress. We trialled a couple of FreshTec mattress toppers and were amazed at how well they performed – especially for those of us who get very hot very quickly at night. I hope these pointers have been useful reading – and don’t forget to enjoy your time away in the caravan or motorhome! The benefit of a touring holiday is the freedom and adventure of it, as well as knowing you can wake up in your own bed in a new place; alternatively, of course, you can simply take in the stunning views as the sun goes down. For more hints, tips and helpful videos for caravan or motorhome-related topics, why not subscribe to our YouTube channel, where we cover these areas and plenty more besides?